Gail Mercer has published many articles in Stocks & Commodities magazine and was interviewed by the Jayanthi Gopalakrishnan and Bruce Faber on May 4, 2011. Below is a list of her Stocks & Commodities articles, which can be purchased online. Stocks & Commodities is the premier magazine in the field of technical analysis. Interview – Gail Mercer, a 15-year veteran of the trading industry who is the founder and CEO of TradersHelpDesk, has dedicated her career to helping traders achieve success. Committed to helping traders grow from amateur analysts to master traders, her unique methodology is rooted in her philosophy that success depends not on a trader’s indicators but the ability to remain focused and responsive to price. Self-responsibility, another cornerstone of her work, provides the mirror for what a trader needs to learn about him- or herself in relationship to the markets. Working with both the inner and outer aspects of trading, Mercer provides an integrated and holistic blueprint for prospering in the markets. She was interviewed by the Stocks & Commodities on May 4, 2011. Looking at Other Markets – Most new traders gravitate to the S&P mini because of its average price range. But here’s a look at daily price movement in the currency futures vs. that of the S&P 500. Which one has larger price movements? Many new traders begin their trading experience on the mini indexes, with a primary focus on the mini Standard & Poor’s 500, as either a scalping trader or an intraday trader. Their daily profit target is normally between three to five points (at $50 per point). Sounds reasonable, right? Wrong! For an experienced scalping trader, this could be done, but not very likely for a new trader. To understand why, we need to look at the daily movement of the mini S&P. For October 2009, the mini S&P moved 19.27 points per day on average. Therefore, if the objective is to capture five points a day, a new trader is trying to capture 26% of the daily movement, which is quite hard for someone new to trading. Now, let’s take this a step further and look at the individual daily movement. Empowering Traders to Trade Commodities – With more and more products being added to the marketplace, how do you decide what to trade? Here’s a look at what you should consider before trading the commodities. New traders are often overwhelmed at the number of different instruments they could trade. Should they trade stocks, indexes, exchange traded funds (Etfs), spot forex, or currencies? What are the market hours? What are the tick values? What is the slippage for any given instrument? What is a good profit target for the market they choose? What stop should they use? So many questions to ask and so many new things to learn! Empowering Traders to Trade the Russell 2000 – New traders are drawn to the emini Standard & Poor’s 500 like bees to honey. Go into any live trading room and chances are that the moderators are teaching traders to trade the emini S&P 500 because it has more liquidity than any other market. In Figure 1 the average annual volume is compared between the following emini indexes: emini S&P 500, Dow Jones Industrial Average (Djia), Nasdaq 100, S&P MidCap 400, and the Russell 2000. It would be a logical assumption that the emini S&P 500 moves more than any other market. After all, volume fuels the markets, and the emini S&P 500 has more volume than any of the other indexes. However, let us look closer to see if the emini S&P 500 leads in tick movement or dollar movement. Volume and Divergence – Here’s how you can use a divergence between price and volume for trading forex futures or exchange traded funds. The first time I looked at volume on my charts, I thought there had to be something significant in those bars, but I just could not put my finger on what it was. So to find out, I read books, went to seminars, attended online webinars, and studied all the cutting-edge techniques: the low-volume bars, the high-volume bars, the ultra high-volume bars, the signs of weakness, and the signs of strength. Yet on the live edge of the market, the concepts eluded me. Instead of trading, I found myself frozen with fear of pulling the trigger because I did not know if there were hidden buyers or sellers behind the bar. Binary Options – Scam or Trading Methodology – They’re gaining attention among traders, but how do you trade them? Here’s one way to get started. Though binary options have been around since 2007, over the course of the last few years, they have seen a huge growth in popularity. For those who are new to them, binary options are simply short-term option contracts with a limited risk and limited reward amount. Choosing A Binary Options Provider – While some traders instantly think “scam alert!” when they hear the words binary options, the truth is that binary options can provide excellent and profitable trading alternatives for volatile and nonvolatile markets. 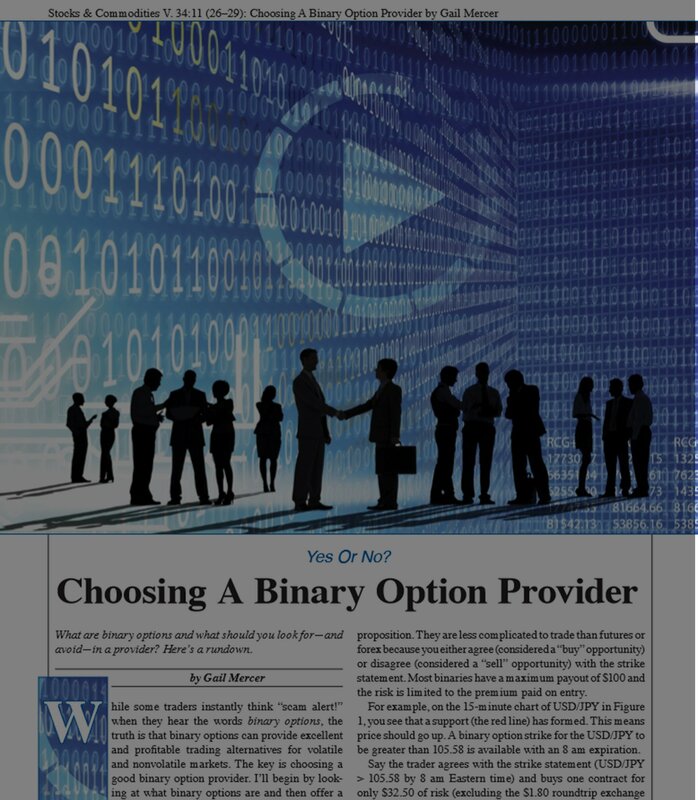 The key is choosing a good binary option provider. I’ll begin by look-ing at what binary options are and then offer a few guidelines on how to choose the best binary option provider. Why do Traders Love Binary Options – The answer is simple—you can avoid most pitfalls that cause failure in trading. The reason traders love binary options is simple. Most pitfalls that cause a trader to fail can be avoided with binary options. This gives the trader a greater chance of success. Most traders fail for one or more of the following reasons. Trading the Non-Farm Employment Report – Trading the nonfarm employment report can be dangerous and result in a margin call if you are on the wrong side of the market. Here’s a better way to take advantage of high volatility using binary options.